The Bar Towel is proud to present a new series entitled “A Beer At…”, where we feature a single bar or restaurant, have a beer there and get a feel for what makes them special. Our first visit is to Chicago’s famed The Publican, a shrine to beer and pork in the city’s hot Fulton Market/West Loop area. The Publican’s European beer hall feel is unmistakeable. The Publican in Chicago is a beer destination in every sense. It is grand, it is unique, and the beers are always interesting, delicious and selected with an evident sense of great care and appreciation. It’s a place where I make it a point to stop in for a beer every time I’m in Chicago, so it’s a fitting to be the first feature of our new “A Beer At…” series, where we visit special beer spots and find out what makes them great. And in this first feature we are also fortunate to have a live chat with Adam Vavrick, Beer Director of The Publican for a complementary Bar Towel Radio podcast. Upon entering The Publican you know you’re somewhere different. It’s a large, open space with numerous large communal tables lining the floor and rows of grand, bulbous lights hanging from the ceiling, reminiscent of a European beer hall. You can’t help but notice the massive murals of pig artwork adorning the walls – they love their pork (and more) here and aren’t shy to feature this fine animal throughout. The Publican can be a place of juxtaposition. Although meticulously designed and refined, there is a definite casual and fun air to the place, with classic cheese rock jams from Journey, Aerosmith and Bon Jovi emanating through the bar on an early evening on Saturday. It’s a place where fun and fine come together seamlessly. Local food is important to The Publican, and across their menu highlights of pork, oysters, fish and cheese, farmers or location are identified to provide provenance. And local beer is also important, but a wider reach is featured on the beer menu. Within their twelve draught taps alone five states are featured from the U.S.A., alongside Germany, Austria, Belgium and the Netherlands. Breweries represented on tap at my visit included The Bruery, Stone, Left Hand, Half Acre, Allagash, Lindemans, Krombach, Andechs, Hirt and Koningshoeven. An extensive bottle list also includes the U.K., Japan, Canada and vintage offerings such at Aventinus, JW Lees and Orval. The beer list changes regularly, and every visit will provide a new experience when browsing the excellent menu. 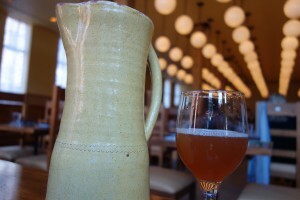 The delicious Lambic Doux, served in a clay pitcher. Now we’re here to have a beer, and the beer we’re having is Lambic Doux. This is one of the most unique beers you’ll find in Chicago, as it is literally one-of-a-kind at the Publican. The Lambic Doux is The Publican’s house blend lambic that features a unique mix of added flavours in small batch quantities. 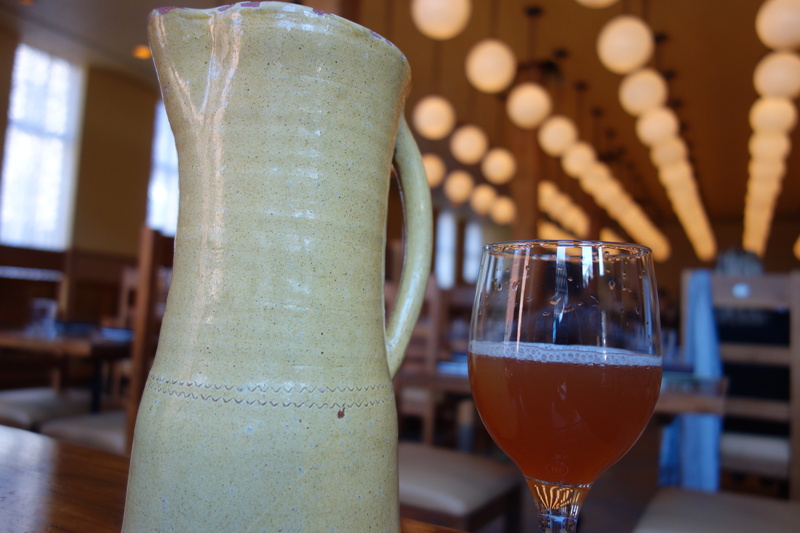 Served in a clay pitcher, having the Lambic Doux is a delicious and special treat, almost a sensory teleportation taking you from the bustle of the city to the farm table of Belgium. At this visit the Lambic Doux was flavoured with blackberry, mint and lemongrass, an orangey-pink hued beer with a light head and a rich sourness, with the added flavours evident. It’s simply delicious and a beer I find time for during every Chicago visit – and so should you. 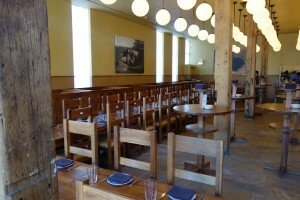 The Publican is located at 837 W. Fulton Market in the Fulton Market / West Loop area of Chicago. Formerly an industrial and meatpacking district, this area has transformed in recent years to house some of the city’s most renowned restaurants and bars. Across N. Green Street facing The Publican is their offshoot Publican Quality Meats, a delicious casual spot with sandwiches, beer and meat and food to go. The Publican will also be opening a location at O’Hare Airport in the near future. 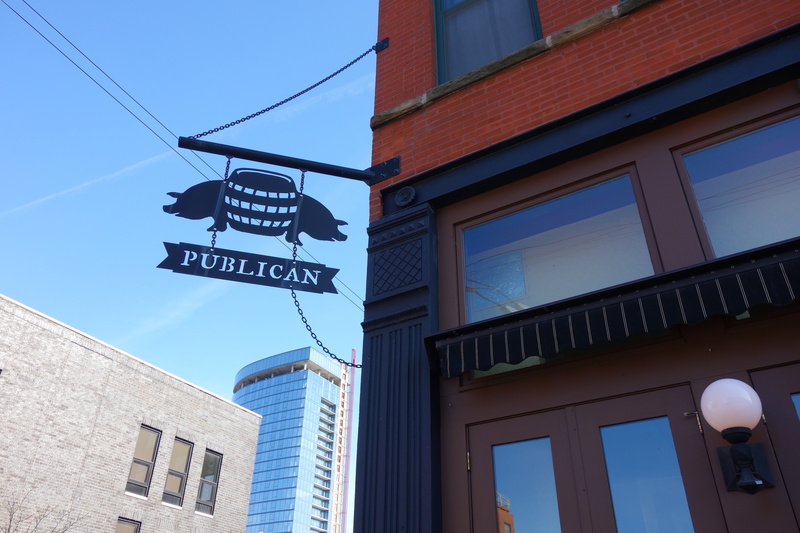 The Publican is open afternoons and evenings seven days a week, with daytime brunch on weekends.